2016 has been a surprisingly good year for horror films. Not just in terms of quantity, but quality as well. We've had cult items like THE GREASY STRANGLER and NEON DEMON, but also more mainstream fare like THE SHALLOWS, DON'T BREATHE, GREEN ROOM, THE PURGE: ELECTION YEAR, and even the seemingly pointless prequel OUIJA: ORIGIN OF EVIL. All solidly enjoyable genre outings that surprisingly did well with both critics and audiences. 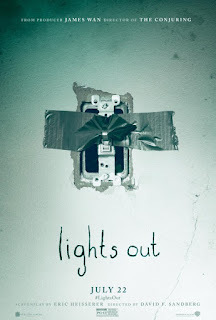 Add one more film to that list: David Sandberg's LIGHTS OUT. Sandberg first came to my attention with his 30 minute featurette KUNG FURY, a loving homage to/parody of low budget eighties action films. I had issues with it, notably the (over)use of decidedly non-eighties CGI, but it was a fun way to pass thirty minutes. 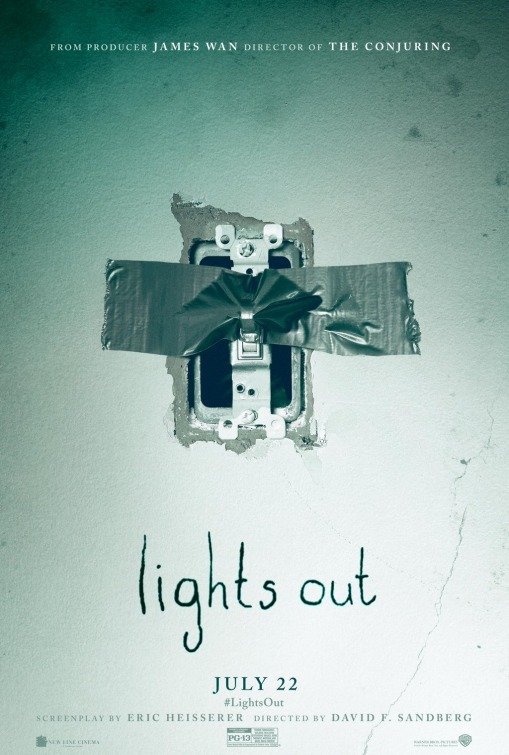 Sandberg also made a short version of LIGHTS OUT for a film contest, and although it didn't win, it brought him to the attention of Hollywood, resulting in this feature length expansion. Turns out this is a different David Sandberg. Sorry for any confusion I may have caused. The premise is straight forward and simple, with minimal characters and locations. There is some sort of supernatural nasty (named Diana, we eventually learn) that can only take form in the dark. And it isn't very nice, as Paul (Billy Burke) finds out the hard way in the film's frisson-filled opening scene. After Diana dispatches Paul, the film shifts focus to Paul's son Martin (Gabriel Bateman), step daughter Rebecca (Teresa Palmer), and widow Sophie (Maria Bello). Rebecca's slacker boyfriend Bret (Alexander DiPersia) rounds out the primary cast. Even before the loss of her husband, Sophie had been relapsing into depression, and perhaps some other form of mental illness. One of the most noticeable symptoms of this is that she frequently talks to an unseen being. Of course you don't have to be a horror film expert to guess that the unseen being is Diana, the same entity that killed Paul. And now it seems to be threatening Martin as well, forcing the young boy to stay up all night with the lights on. This results in him falling asleep at school. After failing to reach Sophie, the school calls Rebecca to discuss the issue. Martin wants to go live with his Sophie, but she's reluctant to go along with this plan. Once she sees for herself how bad mom is, though, she changes her mind. From there on out, the movie becomes pretty much a pure scare machine as the characters keep finding themselves plunged into darkness, trying to pull out some kind of light source in time to keep Diana from doing them harm. The movie is PG-13, so it's relatively light on violence and gore. That doesn't mean it's short on thrills and chills, though, as director Sandberg does a fine job of staging his frights. Beyond the scares, which are the film's primary reason to exist, there's also a reasonably satisfying subtext about mental illness and the effect it can have on a family. Nothing too deep, though, and if you just want to enjoy the movie on its surface level, that's fine. 3 out of 4 stars.